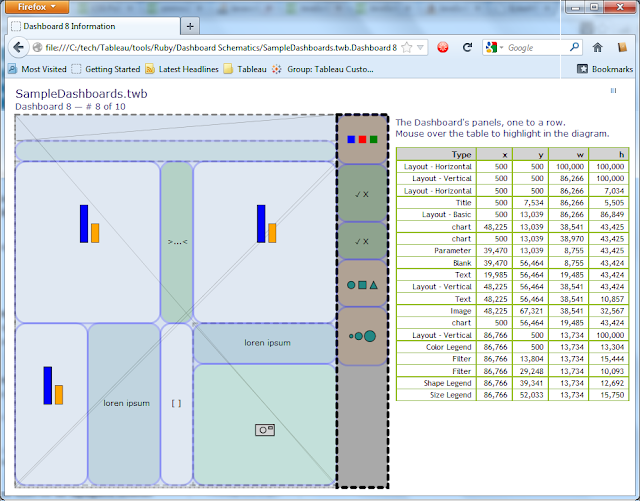 Tableau Friction: Dashboard Imaging — see beneath your Dashboard's skin. Dashboard Imaging — see beneath your Dashboard's skin. When building Tableau dashboards it's helpful to know what's already in them – placing and organizing components is affected by the components already in there. Where you can place things, and how they behave when you do is particularly sensitive to the presence of layout containers. And there are multiple types of layout containers—horizontal and vertical containers are available in the dashboard window so you can place them into the dashboard, although their behaviors aren't well, if at all, documented. For example, a vertical container pushes it's contained components into the minimal space at the top, which is handy as it's the only way one can top-align text, the regular dashboard text component lacking that ability. 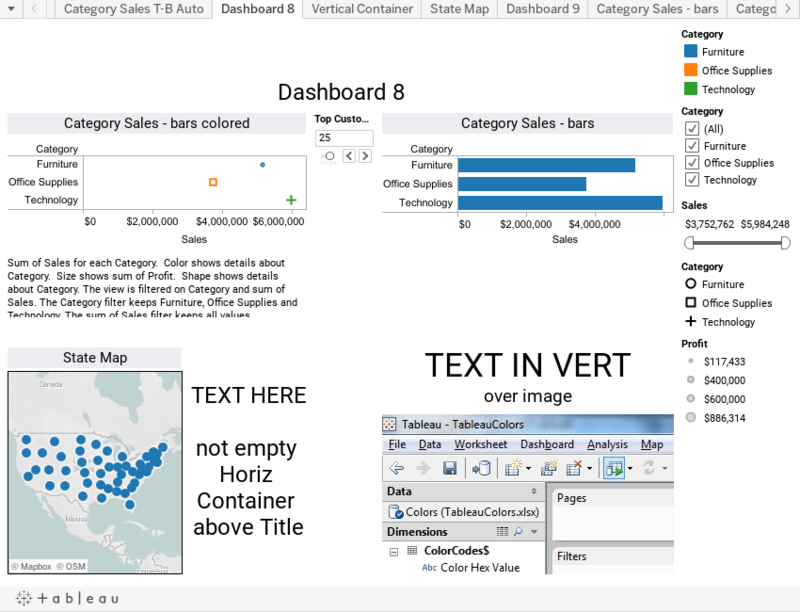 There are at least two other containers that Tableau puts into dashboards as you add and manipulate components. Tableau uses these for its own purposes, and even though they affect the dashboard's layout and behavior, Tableau doesn't let you know that they're there, although in some cases (I haven't quite puzzled this through) they can be seen via a component's "Select Layout Container" right-click option. It would be nice to see what component panels are in a dashboard. For example, this Tableau Public-published workbook contains "Dashboard 8", which has a variety of components. Dashboard 8 is nothing special, there appear to be a dozen or so visible components in it, but how to tell for sure, and how do we tell what (layout containers are in it, abd what their types are? 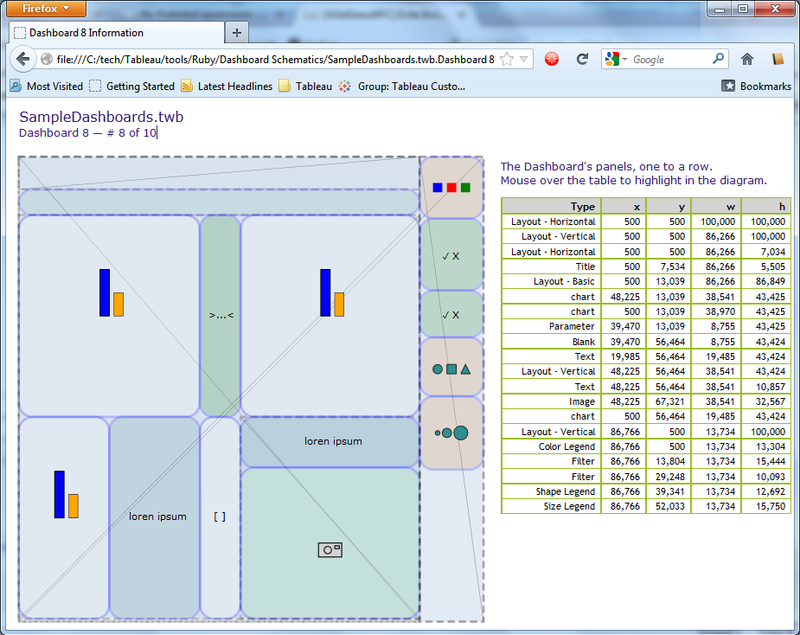 Dashboard 8 has 20 components. The image above shows Dashboard 8's components laid out so as to show them in context, with their essential characteristics including type, dimension, and placement visible. The diagonal lines span the horizontal and vertical containers, forward-leaning for horizontal, backward-leaning for vertical. 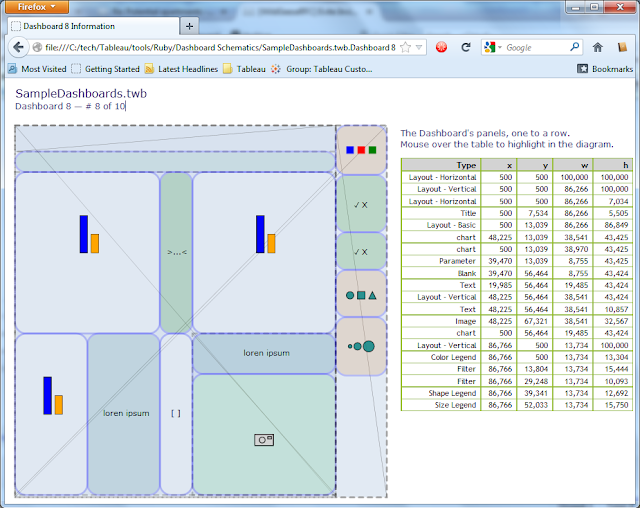 The image shows a single HTML page with the schematic on the left, and Dashboard 8's components in the table on the right, one component per row. The static image is nice, but there's more. How'd your get that schematic/HTML page? I'm glad I asked. The HTML page is generated by my latest Ruby tool. When run it locates all of the TWBs in the local directory, and in all sub-directories, and creates a separate HTML page for every dashboard in every workbook. Running on my local machine it takes a minute or so to find and create the HTML for 1308 Dashboards in 662 Workbooks. Great post! I've just started with Tableau and I like to know what's going on behind the scenes so I really enjoyed reading this blog. Is there any chance that you can share your Ruby tool?